For powered prestretch equipment. Provides outstanding stretch and cling for stabilizing loads. 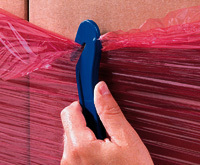 Puncture- and tear-resistant film deters tampering. Wound on a 3" fiberboard core. Quiet release.